Posted on February 22, 2016 by Lea S.
The silent era was rich in many ways, its finest films offering beautiful cinematography and exquisite lighting as well as talented actors and poetic storytelling. It was also supremely unique, preserving an era of history that can never repeat itself. Truly, no art form today can possibly boast an equal wealth of…painted-on eyebrows? White makeup, darkened lips, heavy black eyeliner–these are some of the more blatantly old-fashioned elements of silent films that can throw modern viewers for a loop. So what was the goal behind early movie stars looking a little more mime than man? The origins stretch back to the stage era, as you could’ve guessed (and probably did!). But more specifically, it stretches back to the humble gas light. 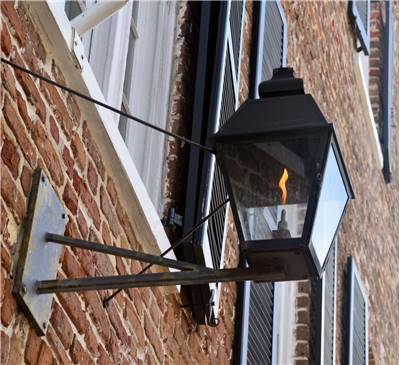 In the 18th century and earlier, theaters were lit with candles and oil lamps. These softer, glowing lights had charm, but made it necessary for actors to apply heavy makeup to make their features more distinct. (Some of the looks evolved out of stage traditions too–e.g., during the Renaissance era in France farce comedians would sport white faces.) If the makeup happened to be a little thick or slightly crude, no big deal–flattering candlelight hid it beautifully. 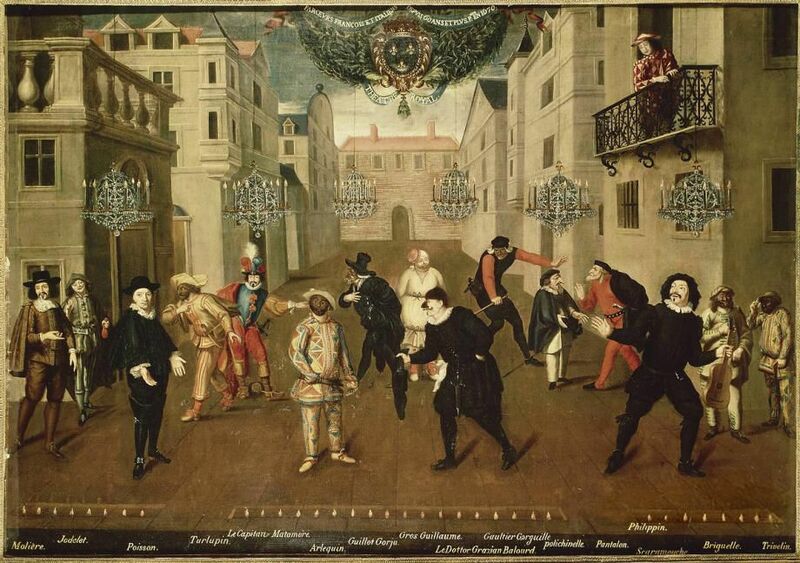 Chandeliers lighting a stage in 1670. Not only was makeup still essential, but it had to be applied with skill to minimize any flaws that the gas lights could pick out. Actors experimented with powders mixed with different types of grease: lard, suet, tallow, beeswax, lanolin, you name it. Greasy makeup had been around at least since the 18th century (and was sometimes removed with butter! ), but now theater folk worked to develop the perfect products for the new era of brightly-lit stages. 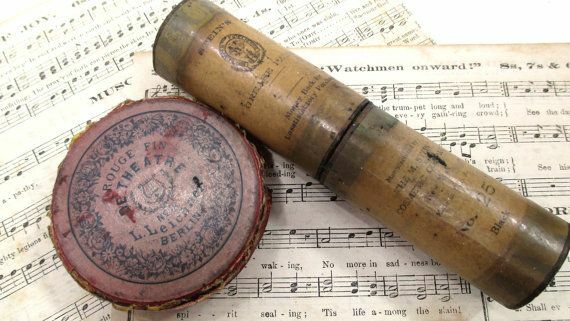 In 1873 Ludwig Leichner became one of the first to market greasepaint, which came in sticks. Other marketers soon followed suit, making flat sticks, pots, and cardboard tubes of the popular paint. 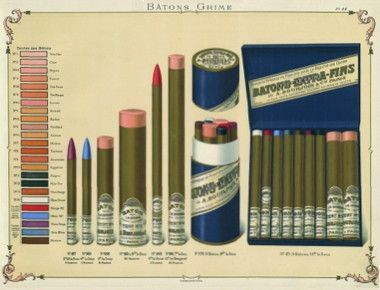 An 1898 ad for Baton’s Grime makeup. Greasepaint stick and rouge from the 1920s. By the time the cinema came on the scene in the 1890s and 1900s, actors had been perfecting the use of greasepaint and other liners and powders for decades. But once they started working in “pictures,” they were back to square one. 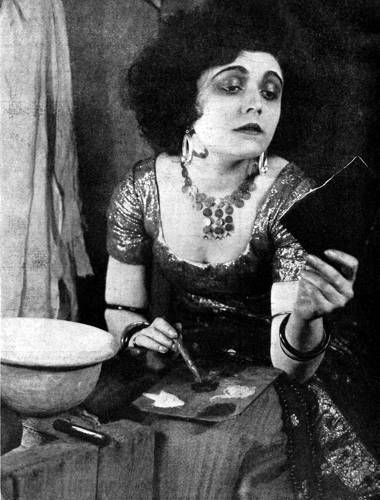 White greasepaint, eye liner and painted eyebrows in this still from The Last Notch (Motion Picture News, 1911). Thus, early movies display a bit of trial-and-error–some actors plastered on the greasepaint, while others wore just a touch of powder (to the occasional relief of directors). Skin was often lily-white–it not only “normalized” faces but was considered attractive and youthful (at least until Doug Fairbanks Sr. popularized tanning). White chalk was sometimes added to hands, to help them match the faces. Eyes were nearly always lined with kohl to help them stand out. 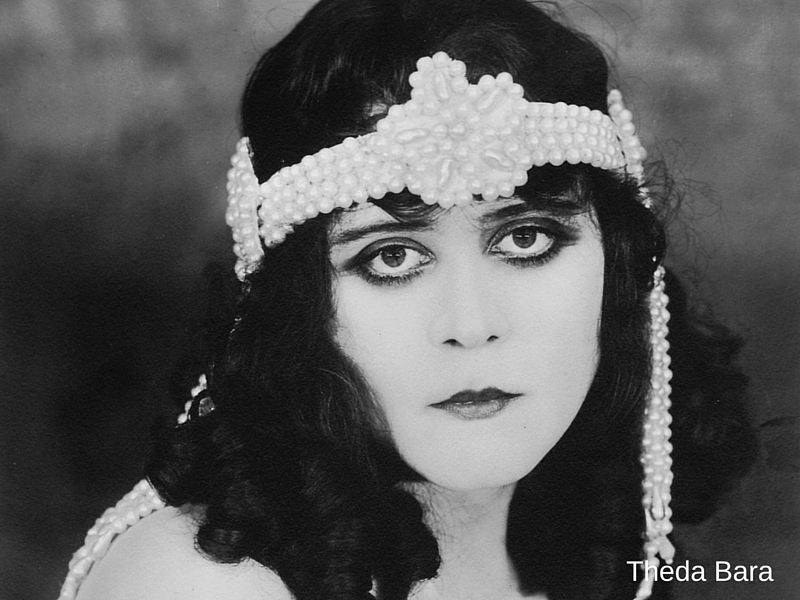 For sensuous temptresses like Theda Bara, heavily lined eyes became a trademark. 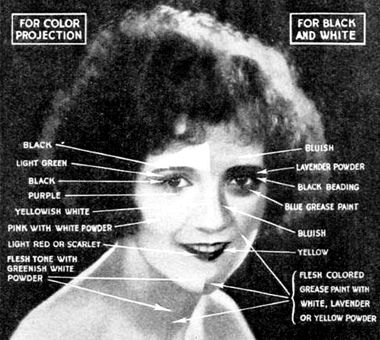 By the 1910s makeup was adapting itself to the screen, especially once closeups were involved. 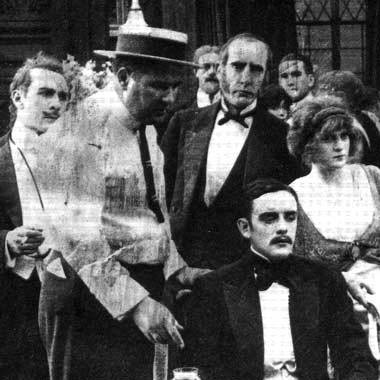 It was unique in some ways too–in many Edwardian films it wasn’t unusual to have the main actors heavily made up while extras wore little greasepaint to none, helping the actors stand out. Bobby Harron is clearly the main character in this 1912 Griffith film. (Behind the scenes still. Source: Cosmetics and Skin). Soon there were different tones of greasepaint for men and women, making it easier to appear natural. There was also a range of colors for playing “ethnic” roles, as was common back then. Special powders were designed just for film use. In 1914 Max Factor kindly took a lot of the guesswork out of makeup by releasing his “Supreme Greasepaint,” which came in twelve shades. By the ’20s it would increase to thirty-one. Factor’s product from the early ’30s. Now, if there were exceptions to the rule of trying to look “natural” onscreen, they were certainly snapped up by the silent comedians. 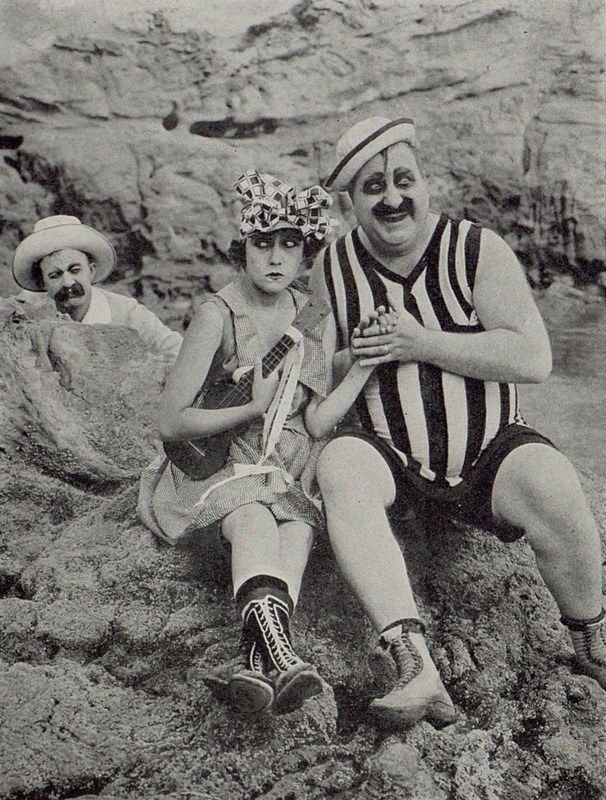 All the crepe mustaches and floppy costumes of the vaudeville stage were carried over to film. Faces glared white, eyes were often heavily-lined, and the painted-on eyebrows were nothing short of luxurious. Ford Sterling, Mack Sennett and Mabel Normand in their respective screen getups. Chester Conklin, Gloria Swanson and the obviously fearless Mack Swain in The Pullman Bride (1917). The makeup not only screamed “CLOWN,” but went hand-in-hand with “comedy” to early audiences. (I also wonder if any of it was supposed to be lampooning the makeup of serious dramas–satire and exaggeration were comedic staples, after all. Just a thought!) The tradition began to fade by the late ’20s, when it became fashionable for comedians to adopt slick “everyman” appearances. 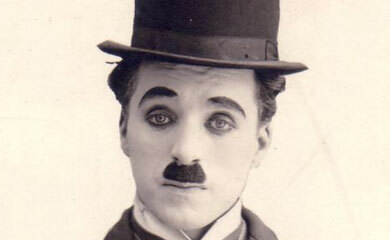 Chaplin was one of the few holdouts, wearing his signature mustache and eyebrows up through the ’30s. 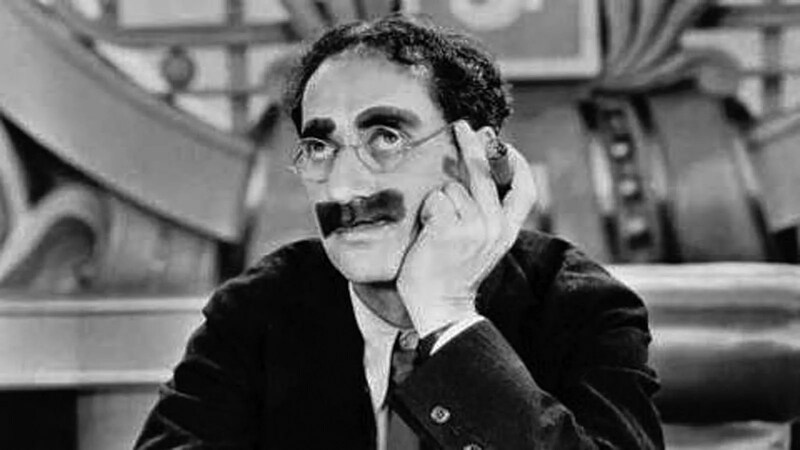 To say nothing of Groucho Marx. Step 2. Apply greasepaint in streaks to your entire face and blend carefully with your fingers so it’s as even as possible (the camera picks up on all imperfections). It needs to coat your skin all the way up to the hairline. Be sure to apply it to the backs of those ears! Step 3. Add a light layer of yellow powder with a puff. Dust off the excess powder with a brush so that the skin appears smooth and matte. It’s recommended that you repeat this two or three times. Step 4. Whoa, you look like a ghost! Time to line your eyebrows with black or brown liner–brown is preferred, since it looks more natural. Step 5. Keep your eyes from looking like creepy white holes (especially if they’re light blue) by applying black, blue, or green eye liner–darkest at your lash line, and lightening as you blend it outward. Step 6. Your eyes still look kind of creepy–use a lit match to heat up black eyeliner in the tiny pan it came in, then line your eyes. Step 8. If you’re a woman, add some carmine to your lips (a type of rouge). If you’re a man, leave them bare. Step 9. Time to fine tune! If you have a dark tooth, paint it with white enamel. Facial imperfections can be minimized with putty or contoured using rouge and white liners–but proceed with caution, as this is expert territory. Step 10. Go strut your stuff before the camera! Final Step: When the days’ work is over, apply cold cream and wipe skin clean with a cloth. Get ready to do it all over again tomorrow! By the 1920s orthochromatic film switched over to panchromatic film, which wasn’t blue-sensitive and registered colors more naturally. Makeup “specialists,” many of whom had started assisting actors with makeup in the late 1910s, were called in to figure out how to adapt the greasepaint to the new film. Studio lighting was improved with incandescent lamps. All in all, makeup started to become more subtle. In 1937 Max Factor introduced his Pan-Cake makeup, which eliminated the need to add powder. And thus the era of the old, greasepaint-and-powder makeup came to an end. In these days of expert makeup departments transforming people into everything from Mad Men-era bombshells to Middle Earth orcs, there’s something enduring about an era when actors painstakingly applied their own paints and powders in ramshackle dressing rooms. While the looks they created became dated very quickly, personally, I can’t ever get enough of those painted-on eyebrows. Bernique, Jean. Motion Picture Acting For Professionals and Amateurs. Producers Service Company, 1916. Brownlow, Kevin. The Parade’s Gone By. New York: Knopf, 1990. Golden, Eve. Vamp: The Rise and Fall of Theda Bara. Vestal, New York: Emprise Publishing, Inc., 1996. This entry was posted in Exploring the Silent Era, Uncategorized and tagged greasepaint, Ludwig Leichner, makeup, Max Factor, orthochromatic film, panchromatic film, silent film makeup by Lea S.. Bookmark the permalink. It makes my face feel dry and irritated just thinking about putting that makeup on and off, day after day after day…! Nicely done Lea, I know there is a chapter in Carl Gregory’s “Motion Picture Photography” that deals with makeup, and even in many of the “Amateur Film Magazines and journals it was a subject covered from time to time. It is interesting to see how the application of makeup, and things like lighting techniques evolved over time with to take advantage of changes in film and technique as he industry matured. It varied so much, too–one studio might have the latest lighting technology, while another made do with ramshackle sets and filming in public parks. Silent comedian makeup probably fascinates me the most, being so deliberately over the top! This is what’s known as a massively informative and entertaining post. Wonderful, Lea. You’ve outdone yourself. I love the way you get into depth on things that I never would have thought to investigate but are so fascinating when examined closely and put in context. One of my favorite Silentology posts ever! Thank you so much, Carrie! 😀 Details really open up new “windows” into the silent world, I dare say! I was also a bit frustrated at one point at how few details seemed to be available on early film makeup. Biographies don’t usually mention much about makeup. Even The Parade’s Gone By barely talks about it beyond an anecdote or two. Fortunately both Lantern and the Cosmetics and Skin websites turned out to be fabulous resources! You always go into such great detail in all your work. I wish I had the vitality to be just as thorough on my own blog! Gosh though, reading all this does make one’s face itch. Film historian Michael Blake said several former silent film actors he interviewed admitted that the make-up could be a pain, especially when the make-up artist tended to handle the face roughly! The more you know! 🙂 Makes me think of that famous Man Ray photo. What a fun read! I had always wondered about the relationship of film tonality and makeup during those days. Honestly, the way you present your (very thorough!) research is like a breath of fresh air. That’s a lovely compliment, thank you Nicole! What an excellent article! I love learning about the technical side of silent film. Wonderfully written article! I learned a lot. Those stills with the contrast between makeups of the stars and the extras were particularly interesting. Now that’s something I’ll be looking for. In the comedy department, I always got a kick out of Mack Swain. I think he was definitely the most extreme! Agreed, talk about a lot of eye makeup!! I wonder if Mack used so much to balance out the mustache or something like that…but that lock of hair on his forehead is a puzzler too, lol! An example of a makeup misfire that I recently noticed—in the opening scene of Alice Guy Blaché’s Falling Leaves, the little boy’s cheeks have been over-colored, apparently to indicate the robustness of his health after the cure. Those are some industrial-strength rosy cheeks! That short is one of my favorites, by the way. I noticed the marvelous Ben Model has posted it on YouTube with his excellent score. Do you like it? I have! That’s a good one; after reading some O. Henry stories recently I realized the plot is very similar to his “The Last Leaf”! Another fantastic article ! Thanks for bringing so much valuable information to silents lovers. What an excellent and informative article! It makes me wish that some Autochrome photos could have been taken on the film set to see how our favorites looked–“in real life.” 😉 I think that Chaplin was photographed in color from a distance circa 1919, but I haven’t seen any others. Glad you enjoyed the article! 🙂 There must be a few Autochromes out there, although I’m not sure where. Early color film sequences are interesting to see too, although for whatever reason I really prefer the sepia/black and white originals! Pingback: The History of Circuses (the Birth of Comedians and Clowns…) | BAREFEET BARISTAS ARE PEERK'D!